Yes, there really is a place called Gibble Gabble. More accurately, it’s a street – or, more accurately still, a ginnel. Collins Dictionary defines this as ‘Northern English dialect’ (but you knew that, didn’t you? ): ‘a narrow passageway between buildings’. Which is pretty well what Gibble Gabble is – a twisting cobbled path running up a steep slope in the old mill village of Broadbottom. But how did it acquire its delightful name (Gibble Gabble, that is, not Broadbottom)? From the noise made by millworkers streaming down the hill to Sidebottom’s mill, the clattering of their clogs drowned by their loud Lancashire laughs? Happen, lass, that’s how it were…. 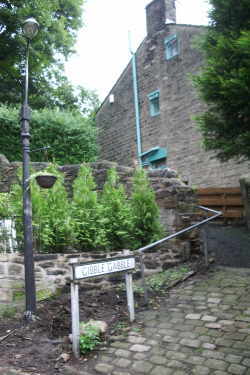 But wait: my friend Jim, brought up in Tintwistle (or ‘Tinsle’ as the locals call it) has just told me that his mother calls a ginnel a ‘gibble gabble’. This seems to be localised to Mottram and Broadbottom; even in Tintwistle they use the term ‘ginnel’ (pronouncing it with either a soft of hard ‘g’). So calling the ginnel Gibble Gabble is rather like naming your road ‘Street’. Ay, there’s nowt so queer as folk: it’s no coincidence that Vivienne Westwood comes from Tintwistle, after all. Of course, I’m just makin’ this up and gabbling on about nowt. If tha’ wants to find out about Broadbottom proper, like, tha’s best ignore me and tak a look at the Broadbottom History Project Website. Where you’ll not be assailed by fake Lancashire accents, either.